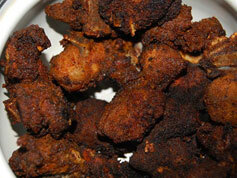 Learn how to make Mutton fry recipe using our easy to make homemade Mutton fry recipes. Try this homemade Mutton fry cooking recipe at your home. Wash the mutton properly and cut it into small pieces. Finely chop the onions and keep it aside. Take a blender and add the garlic, ginger, cloves, cardamom, cinnamon, vinegar, red chilly powder, coriander powder, pepper, turmeric and salt to taste and make a fine paste. Now put the mutton pieces in a big bowl and pour this paste on it and let it marinate for an hour or two. Now take a handi or a pot with a deep lid. Put the mutton inside and then pour water over the lid and cook. Add a little hot water and the mutton pieces slowly slowly. Keep stirring and bring to boil. When the water is boiling simmer and cook till the gravy thickens. Now take a frying pan and heat up the oil. When the oil is very hot add the onions and sauté. When its golden brown add the mutton and the gravy and cook for two to three minutes. Remove from flame and serve hot with rice or rotis.